Toss the wings in the glaze! This is no ordinary wing recipe and took me 2 days to make these! In the end I will say it was worth every minute. I have made wings every way possible… on the grill direct, smoked, baked, fried, etc. You name it and I have done it. This technique would focus on getting the chicken cooked perfectly in the sous vide machine and then getting that crust from the Big Green Egg at the end. I started out by placing the 3lbs of chicken wings in a large bowl with the garlic, ginger, chili flakes, apple cider vinegar, mirin, tamari, and sesame oil. I mixed together the ingredients so that the sauce would coat the wings. After the wings were coated thoroughly I placed them in a Ziploc bag and in the refrigerator overnight. Every few hours as the wings sat in the marinade I would turn the bag ensuring the marinade got to every wing evenly. I would not want one of the wings to miss out on all the TLC this sauce had to give! After 24 hours I took the wings out of the bag and reserved the liquid to make the sauce later. Using the vacuum sealer I sealed the wings in to two separate bags. In addition, I set the sous vide machine 147°F. Once the water in the sous-vide machine gets to temperature I placed the bags with wings in the warm water bath for 2 hours and 15 minutes. During that time I had a beer (or two) as it was Super Bowl Sunday after all! As the wings were coming up to temp I went outside and fired up the Big Green Egg so it would be ready when the wings came out of the water bath. Now the BGE was coming up to temperature (I set it up for 350°F direct) I went inside and removed the bags from the sous vide machine. I took the reserved liquid (from earlier) and poured it into a saucepan. I added sugar and black pepper to taste, reduced the heat to medium, and reduced the sauce by half until it thickened. I set the Big Green Egg to 350°F and cooked the wings raised direct for 3 minutes per side. After you get the good grill marks on your wings remove them from the BGE and toss in sauce reduction. Make sure you have several paper towels on hand to wipe up after eating these delicious wings! 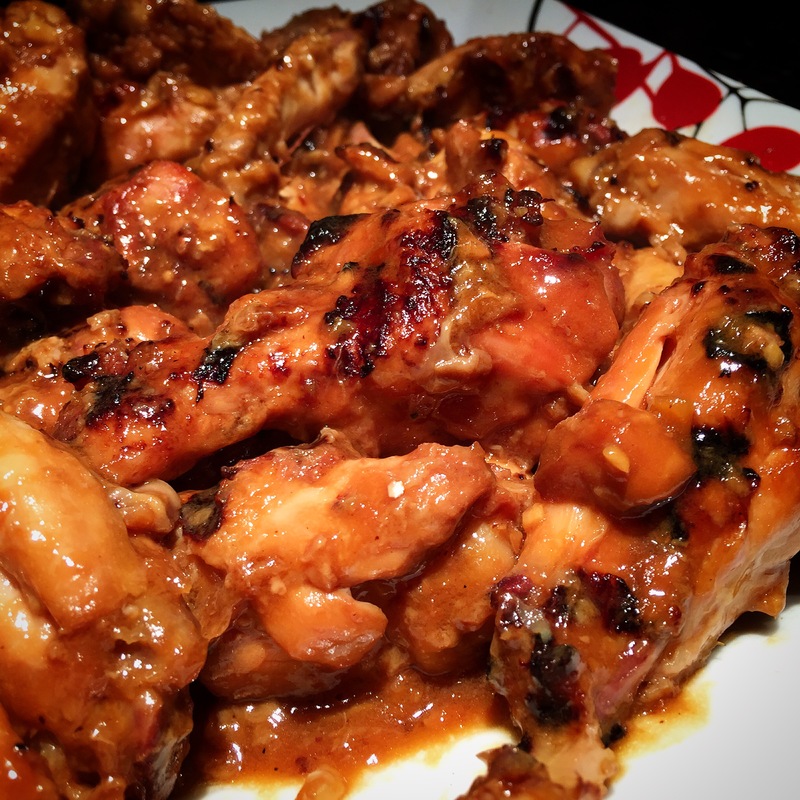 If you liked this recipe try this recipe for Thai Sweet and Sour Chicken Wings! In a large bowl, put 3 lbs chicken wings with garlic, ginger, chili flakes, apple cider vinegar, mirin, tamari, and sesame oil. Mix together so that sauce sticks to wings. Vacuum seal wings with marinade and let sit in fridge from 4 hours to overnight. Once water gets to temp, place bags with wings in the water bath for 2 hours and 15 minutes. For grilling, set the Big Green Egg to 350°F direct and grill wings on each side for 3 minutes. Remove wings from heat and toss in reduction.